Selawik Refuge, in cooperation with other researchers and agencies, works to monitor wildlife populations and gain a better understanding of the natural systems within refuge habitats. We have begun a broad-based ecological research program, focusing on understanding entire landscapes and ecosystems rather than single species. Climate change is already apparent in the Arctic, and is expected to lead to profound shifts in ecosystem dynamics. To prepare for this, we must advance our knowledge of the basic structure of our ecosystems, including nutrient and energy flows, food webs, soil and water chemistry, permafrost, and other landscape processes. Traditional wildlife monitoring can tell us how wildlife are affected by changes once they occur, but only a deep understanding of the ecosystem can help us anticipate change and monitor resources wisely. The huge wetlands area of the lower Selawik River is the only arctic tundra wetland habitat of its size within the National Wildlife Refuge System. The numerous channels of the Kobuk River delta and the estuarine waters of Hotham Inlet form the refuge's western boundary. These tundra wetlands dominate the refuge lowlands, while spruce and willows trace the river drainages. More than 24,000 lakes dot the land, providing excellent habitat for waterfowl, shorebirds, fish, beaver, muskrats, moose, and other species. Much of the soil beneath the surface of the refuge is frozen year-round. This impermeable layer of “permafrost” causes water to pool atop it, keeping much of the land wet throughout the short but productive summer. National Wetlands Inventory (starting summer 2017) - surveying the refuge to construct a wetland baseline at a scale of 1:24K. Work will be conducted by St. Mary's University, Geospatial Services. 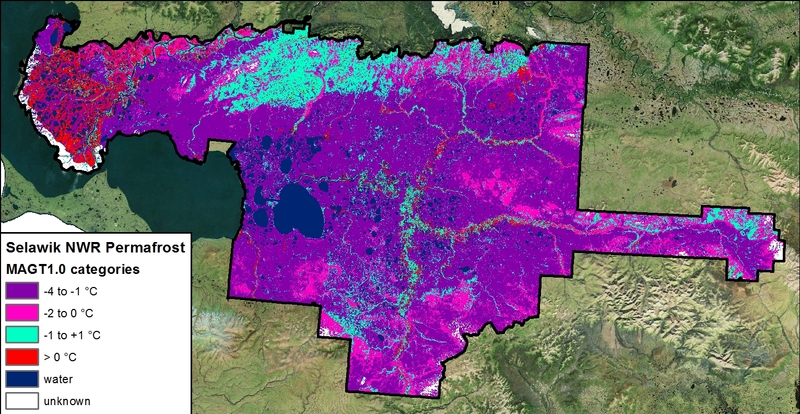 Completed Habitat Report (2009):An Ecological Land Survey and Landcover Map of the Selawik National Wildlife Refuge – Using satellite images and aerial photographs, this ecological land survey for landcover mapping provides a snapshot of plant communities and geographic features such as ponds. Contact us to request a copy or for more information. project website: "Establishing a Distributed Permafrost Observatory Network in Western Alaska"
Scientific evidence confirms that the earth is undergoing a change in climate. Some of the most dramatic evidence of change is being seen in the polar regions of our planet, with plenty of observations from northwest Alaska. Higher temperatures are being recorded, resulting in earlier spring snowmelt, reduced sea ice, and permafrost thawing. A large thaw slump on the Selawik River, pictured at right, has finally stabilized after years of expansion and deposition of soil into the river. Changes in habitat will likely affect wildlife populations in significant ways which we are not able to fully predict at this time. Unfamiliar new weather patterns and changing environmental features seriously impede local residents’ ability to move about safely and to harvest, process, and store wild foods successfully. To understand and deal with climate change, baseline information about current conditions is important so that we can compare it to future conditions to see what has changed. Climate Reference Network station, installed in 2015 by NOAA, provides numerous weather parameters and is part of larger climate monitoring station network. Upper Selawik River thaw slump research (in cooperation with Idaho State University and Los Alamos National Laboratory) on water quality and chemistry, riverbank erosion, glacial history, and slump topography.We continue to monitor the thaw slump opportunistically. Renowned for its tremendous size, fighting ability, and fine eating qualities, the sheefish is a large whitefish found in the vast northern drainages of Siberia and North America. In Alaska, the largest sheefish occur in the Kobuk and Selawik rivers in the northwest part of the state. Sheefish, also known as inconnu, are a highly prized resource for local people and one of the “trust species” the Selawik Refuge was established to protect. Maintaining continued subsistence opportunities for sheefish is also a purpose of the refuge; currently about 20,000 sheefish are believed to be harvested annually in the Kotzebue Sound region. We have been working to understand more about the populations and life history of these important animals. Two distinct sheefish spawning locations have been identified, one in the upper Kobuk River and one on the refuge in the upper Selawik River. No other sheefish spawning areas are known in the region. In the mid-1990s population estimates for spawning sheefish suggested that 30,000 to 40,000 fish spawned in the upper Kobuk River, and about 6,000 fish in the Selawik River. A decade later, estimates for the Selawik River spawning population were approximately 24,000 sheefish in 2004 and 46,000 sheefish in 2005. This significant increase in abundance is thought to result from a particularly high survival rate of young sheefish, which are now a part of the spawning population. Data have not yet been collected to determine whether the Kobuk River population similarly increased during this time. Climate change and its effects on the spawning recruitment of sheefish in the Selawik River, in cooperation with Fairbanks Fish and Wildlife Field Office (lead) and US Geological Survey. Use of DIDSON sonar to estimate the abundance of spawning sheefish in the Selawik River, in cooperation with Fairbanks Fish and Wildlife Field Office (lead) and Native Village of Selawik. Telemetry tracking of sheefish movements during spawning activities, in cooperation with the USFWS Fairbanks Fish and Wildlife Field Office. Investigation of location and preferred type of winter sheefish habitat in the Kotzebue region, in cooperation with University of Alaska Fairbanks, US Geological Survey, Fairbanks Fish and Wildlife Field Office, and the Native Village of Kotzebue. Genetic mixed stock analysis to understand the proportion of the winter sheefish harvest that comes from each of the two spawning populations, in cooperation with the Native Village of Kotzebue and Alaska Department of Fish and Game. Other whitefish species found in Selawik Refuge include broad whitefish, humpback whitefish and least cisco. In the Selawik River drainage, where salmon do not regularly occur, whitefish are an especially important dietary staple, but they are also utilized throughout the region. Despite their importance, these fish populations are not well understood by scientists. Selawik Refuge and our partners are attempting to fill gaps in our knowledge about these fish resources. Although no whitefish projects are currently in progress, recent studies have looked at seasonal migration patterns, important habitats, traditional knowledge, and subsistence harvests. We expect to further investigate these questions in the future. More than 180 bird species visit the refuge, from tiny songbirds to large raptors, comprising an important part of the area's biodiversity. Wetlands and lakes on Selawik Refuge are one of the last stopping areas for hundreds of thousands of shorebirds and waterfowl on their way north to nesting grounds. Sizable populations of ducks, geese and swans stay on the refuge to breed and rear their young. During the fall, over 100,000 waterfowl migrate through the refuge on their way south to wintering areas. These birds are an important subsistence resource for local residents, most of whom are Iñupiat. Conservation of migratory birds and providing for continued subsistence use are among the Congressionally established purposes of the Selawik Refuge. The U.S. Fish & Wildlife Service’s Office of Migratory Bird Management has an important role in monitoring waterfowl and bird species of concern. The Western Arctic Caribou Herd (WACH) ranges across the entire Northwest Arctic region. Animals from the herd cross the refuge during the southward migration in the fall and when heading north in the spring to calving grounds on the North Slope. Because the range of the herd is so large and covers lands managed by many different agencies, working cooperatively to ensure the health of the herd is essential. These animals are a critically important subsistence food source throughout the region, with more than 10,000 caribou harvested annually. The Western Arctic herd is the largest in Alaska, with an estimated population of 201,000 animals in 2016. The Selawik Refuge was established in part to protect the herd’s habitat. Since the 1950s, moose have expanded their range from interior regions of Alaska into the Selawik valley. This has added a new dimension to the ecosystem and provided a new species for hunting. Moose are an important food source for people in northwest Alaska, including the villages on and near the refuge. Moose populations appear relatively stable on Selawik Refuge, with higher numbers in the western, southern and eastern portions. Spring aerial surveys of moose, in cooperation with the Alaska Department of Fish & Game, Bureau of Land Management, and National Park Service, are an important tool for keeping track of the status of moose in the area. From these surveys, which have been conducted in some form since the mid-1990s, we estimate the number of moose in the area, the population density, and the number of calves vs. adults in the population. These surveys are repeated every 4-5 years so we can detect changes in the population over time. "Siilvik" is the Inupiaq name for Selawik, meaning "place of sheefish." One of two sheefish spawning areas in the region is in the upper Selawik River.